There are many ways to collect data. Before selecting the technology for collecting data, we should ask ourselves a basic question – what do we want to achieve with data analysis? In this article named Process Mining and BI in Big Data Technology, we have discussed basic matters around Process Mining and BI in relationship in the vast field of Big Data. If we want to evaluate our data today, we will find a wide range of possibilities and a flood of concepts that make a selection difficult. Around the term big data solutions have formed clusters, which made hard for the beginners to see through each technology has its own purpose and its own way to deal with data. This article is intended to provide information around where the new analysis technique Process Mining is and other methods and terms like Business Intelligence, how it works, and how companies ultimately benefit from it. The actual value of the data lies in its evaluation. The entire process of pre-processing, search and evaluation, i.e. the systematic use of statistical-mathematical methods with the aim of pattern recognition, is summarized under the term data mining. From a technical point of view, data mining uses algorithms that help to establish relationships between the data. Of course, priority is given to correlations that contribute to decisions. Data Mining is thus applied in every intelligent evaluation. With newer data analysis solutions, the end of the development is far from being achieved. Big data technologies are increasingly based on automation and machine learning, so far only the initial steps in this direction are made. Business Intelligence (BI) platforms include the procedures and processes for the collection, analysis and presentation of data to reduce costs, minimize risks, and increase value creation. All possible KPIs – information about one’s own company, the competitors, customers or the market development can be evaluated. A prerequisite for this is that users have to specify precisely what they want to examine – and what the goal of their analysis is. BI uses multidimensional analysis to bring data into context, to identify patterns and discontinuities, and to answer previously defined questions. The approach to prioritize analysis evaluation criteria in a BI dashboard is a limitation, since only parts of a process or certain data and correlations are illuminated. Do we always know beforehand what is relevant? Classic BI vendors, which initially focused on integrating more and more data sources and also unstructured data (such as social media ), placed a new focus on freer analysis possibilities. In contrast to BI, which focuses primarily on individual key figures and provides many points of insight, the innovative Big Data technology establishes process mining on a more comprehensive approach. Here, no individual KPIs, but processes end-to-end and on their efficiency, and are presented exactly as they are in reality. Process Mining collects the digital process within the company and combines them in such a way that process sequences can be visualized from start to end and in all their possible variations. For the new transparency, companies can identify vulnerabilities and inefficiencies as well as deviations from the target in real-time, regardless of the IT system used in Process Mining. This approach in allows a targeted optimization of internal processes and thus promises a very fast ROI. Users do not need to define a predefined question. They can take an unprejudiced look at their processes, identify hitherto unknown problems and derive the right action measures in case of bottlenecks as well as optimization potentials. In contrast to BI, Process Mining can be used to find answers to the questions, when, where and why problems have arisen in the supply chain, for example. In the area of ​​process mining, machine-learning functions already enable the automatic analysis of causes and the derivation of concrete action recommendations from the results of the process analysis. The development is still at the beginning of its possibilities and leaves a lot to be expected. Artificial intelligence will be a decisive competitive advantage for companies in the future. With little effort to use as much data as possible in the company and make it available for targeted optimization, it will be more than ever before. And exactly that is supported by Process Mining. Discovery: Based on an event log, a new model is constructed or discovered based on low-level events. 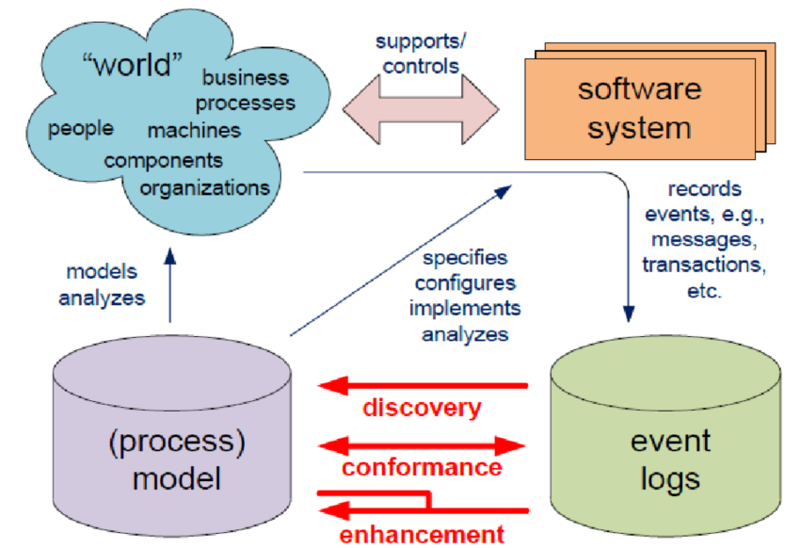 Conformance checking: The existing model is compared with the process event log; discrepancies between the log and the model are analyzed. Extension: The model is extended with a new aspect or perspective, so that the goal is not to check conformance, but rather to improve the existing model. Airflow Authors, Schedules, Monitors Workflows. Here Are The Steps For Installing Apache Airflow On Ubuntu, CentOS Running On Cloud Server. Cite this article as: Abhishek Ghosh, "Process Mining and BI in Big Data Technology," in The Customize Windows, October 9, 2017, April 21, 2019, https://thecustomizewindows.com/2017/10/process-mining-bi-big-data-technology/.